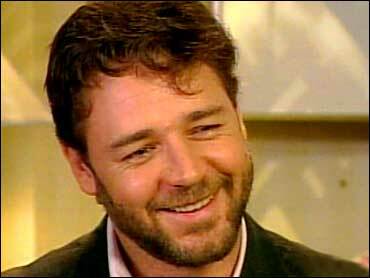 Russell Crowe is on a roll. He married Danielle Spencer in April and they are awaiting the birth of a son in January. He also has another hit film with "Master and Commander: The Far Side of the World." The film took in over $25 million at the box office in its debut weekend. In the film, Crowe plays early 19th century sea captain Jack Aubrey. He took the role very seriously, making sure the film's cast and crew didn't see him in anything other than an authoritative state. "I never got seasick during the course of the production," the actor says. "But I did a lot of work prior to the production to neutralize the possibility of seasickness. You know, I just thought it would be very inopportune for the captain to be throwing up in front of his mates." Crowe says the life of a celebrity isn't something he preoccupies himself with. "You can have a couple of nights where you get a nice table at a restaurant or whatever," he explains. "But after a while, that's kind of whoop-di-do. Who cares?" The best part about Crowe's life, he says, is the impending birth of his child. "I don't think anything else can be superior to that," Crowe reveals. "The excitement and the expectation that's building up for that." The Early Show co-anchor Rene Syler asked the actor how is the couple's pregnancy is going. "Well, I'm doing really well, my wife's slightly different," laughs Crowe. "Yeah, she's doing great. The first three months were pretty rough. And now the sort of size of the baby is starting to affect her a little bit. And she's eternally on the search for a comfortable way to sit." With a very busy film career, a new wife and baby on the way, Crowe has little room for outside projects. He knows he's going to have to give up touring with his band "30 Odd Foot of Grunts." "We tour when there's a gap in the traffic in terms of the movie responsibilities," Crowe says. "But I don't think that gap's going to be existent any more with a baby. That doesn't mean we won't play together or write songs together or record together. But being on the road … halfway around the world, away from my boy, that doesn't sound like a good thing." But, Crowe chuckles, maybe his child will be on the road with him. Syler admits she was a little nervous interviewing the actor, who has a perceived reputation in the media as a hard person to talk to. "I think sometimes it's a cultural difference," Crowe tries to explain of his reputation. "I tend to have a very sharp-edged sense of humor. But most of the time it's directed towards myself." The Australian actor says he feels privileged to tell stories that help people escape the seriousness of the world, so therefore he respects the opportunity he has to make movies. And he says he enjoys entertaining the audience.